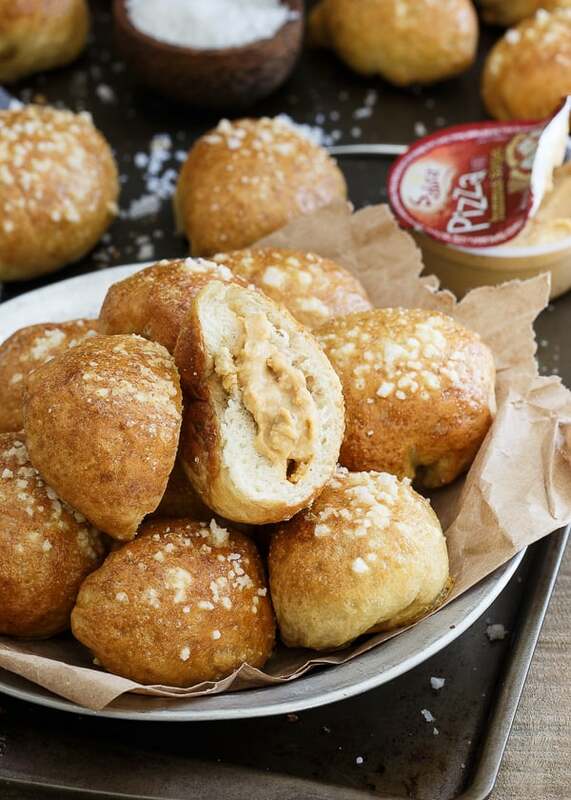 These hummus stuffed pretzel bites use Sabra pizza hummus for a fun football (or anytime!) snack. A salty soft pretzel bite gives way to hummus filled center! The first time I made pretzels was one of the most satisfying culinary feats of my life. That sounds ridiculous, they’re pretzels not foie gras but seriously, I was like giddy with excitement. I get that way with pretty much anything that involves a successful use of yeast but the two step, boil and bake thing pretzels got going on makes it that much better. My thoughts on pretzels are pretty simple: life’s too short to waste any time eating hard pretzels when soft pretzels exist. The end. I don’t think I’ve ever been tempted by the bowl of hard pretzels at a party. I mean for real, the communion wafer at church tastes better than those things. Half the time they’re stale and the other half they’re still meh. Chips win hands down at the “throw it in a bowl and mindlessly eat at a party” food, not pretzels. Soft pretzels, now that’s a completely different story. How can one pass up a soft salted doughy pretzel from the guy on the street corner in NYC to the Auntie Anne’s in the mall with that intoxicating cinnamon pretzel smell wafting around? If you can, I deem you not human. 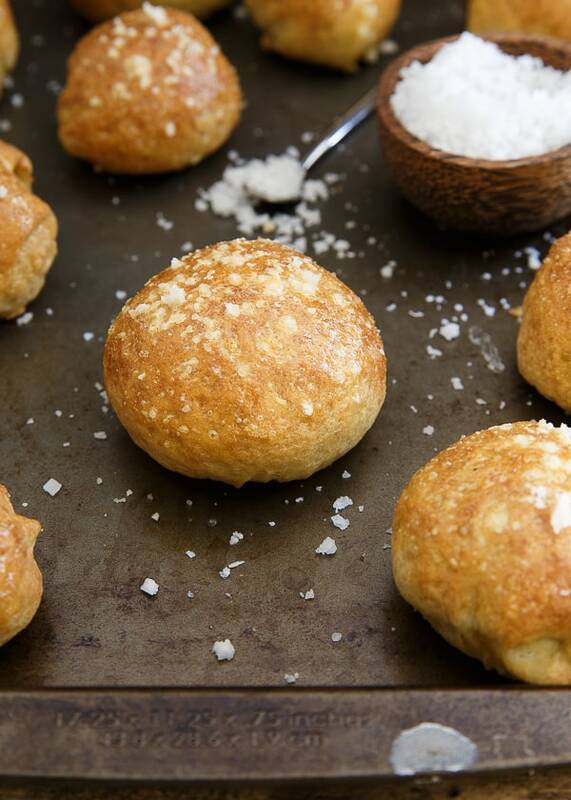 So with my beloved soft pretzels in mind, these pizza hummus stuffed pretzel bites came to be. I hear it’s football season now (you all know how I feel about this ridiculous sport. If not, see this edamame dip post) and the only thing that means to me is TAILGATING FOOD, pretty much the only good thing to come of this pig skin throwing, man tackling spectacle that takes over all televisions (except mine) every Sunday. 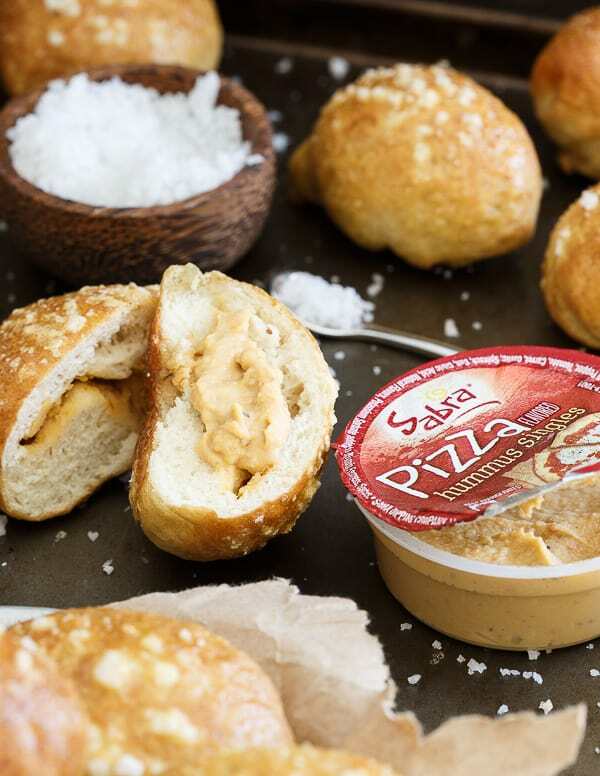 Since pizza is pretty much a staple football food, I figured why not use Sabra’s pizza hummus to stuff inside a pretzel bite? It’s like a two for one of tailgating goodness. A salty browned outside opens up to a pizza hummus stuffed doughy inside only made better by a nice big dunk in some more hummus before eating. Never thought I’d say this, but heck yeah, football! Combine the warm water and yeast in a small bowl and let sit for about 5 minutes until the yeast blooms. Add the flour, salt and yeast mixture to the bowl of a stand mixer fitted with a dough hook. Mix on medium speed for about 3-5 minutes until the dough comes together in a ball around the hook. If needed, add a tablespoon or two of water to get the dough to come together more easily. Coat the bottom and sides of a medium bowl with the olive oil. Turn the dough out and form into a ball, place in the greased bowl, cover with a towel and set aside in a warm place to rise for 1-2 hours until about doubled in size. Once risen, punch the dough down and roll out into a square. Cut into 16 pieces about 2x2 inches each. Place a teaspoon or so of hummus in the middle of each square. Do not overfill, this will make things messy when trying to pinch closed later. Brush the beaten egg around the edges of each piece then fold the sides together and pinch closed with your fingers and set aside. Repeat with remaining squares. Once boiling, add the baking soda slowly. Drop the pretzel bites into the boiling water 3-4 at a time for about 1-2 minutes each. Remove with a strainer and place on a parchment lined baking sheet. Repeat with remaining pretzel bites. Brush pretzel bites with remaining egg. Sprinkle with coarse sea salt and bake for about 15 minutes until golden brown. Remove from oven and serve warm with additional hummus for dipping. These pretzels really would make such a great party snack! I have always had an obsession with soft pretzels! This recipe is not only genius but they look amazing! Im sure hummus and soft pretzels together are heaven! I am with you sister, bring on the soft pretzels, all day long! Love the little surprise in the middle. Such a smart recipe! This is the perfect tailgate food! 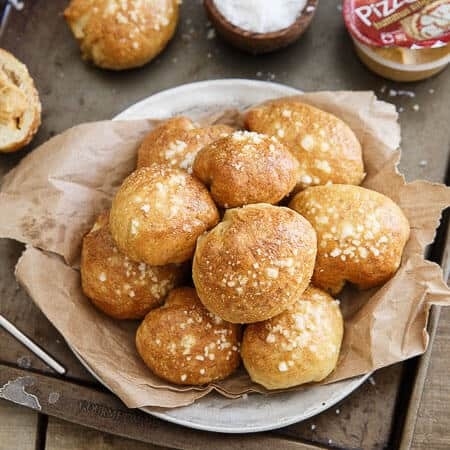 I have yet to try that pizza hummus but it’s calling my name, and so are these pretzel bites! Awesome recipe! 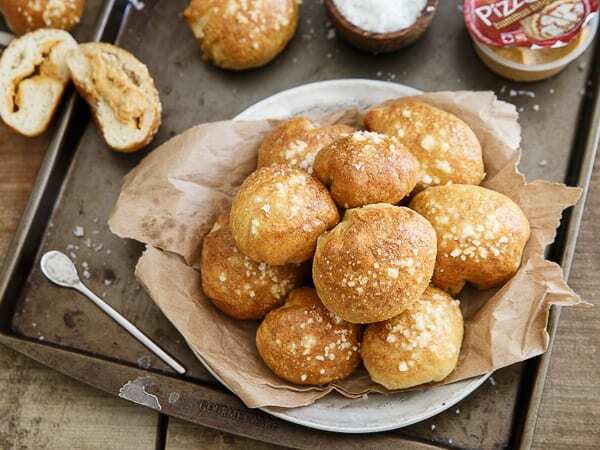 Pizza, hummus, pretzel…you combined all my favorite foods into tasty little bites. I *LOVE* this!! This is brilliant! I will definitely be making these for my guys soon! I hate hard pretzels, they’ve always seemed like such a sub-par snack to me. But these, man I could make a meal out of these! Words can’t describe how much I love these pretzels. I have a serious weakness for soft pretzels. Although I do like hard ones too, soft ones are on a totally different plain of existence.